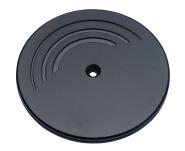 The 85mm Disk Tag is a 134.2 kHz HDX Low-Frequency (LF) transponder. The LF tag is compliant with ISO/IEC 18000-2 global open standard and tags compliant with ISO 11784/11785 are also available. This tag can support 100,000 Programming Cycles at +25°C.